This kitchen knife has saved me hours of time and hand pain. It is designed better than any kitchen knife I have seen. Because the handle is at the top I can apply force straight down to the food I am chopping. Contrast that with regular knives -- you either have to apply pressure indirectly via the handle, or you have to apply extra pressure on the top of the blade, which hurts your hands. Because the knife has a cutout in the middle, I can wrap my hand around the handle. As a result, the knife feels comfortable in my hand. If I remembered more of my high-school physics I would probably be able to tell you why its triangular shape is superior, but suffice to say that after two years of heavy use it has held up well. The edge is serrated, and although chopped carrots don't look as pretty as those cut with a straight blade, my knife gets the job done with a minimum of fuss. The small writing on the side indicates that the blade is made of stainless steel, and that the device is patented in Japan. I don't know how I feel about patents, but as far as I am concerned this is indeed a novel contribution to human knowledge. Before purchasing this knife I had considered purchasing a Chinese meat cleaver. This is much smaller and lighter, which is better for me since I prefer smaller knives. How much did this knife cost? Surely it was $50 or $100? Nope. As the title indicates, I bought this knife and a canvas shopping bag at the tiny and sorely-missed Rockway Thrift Store. The two items cost me a total of $1.41, which means the knife may have been $0.50 or $1.00 before tax. Here's the thing: even though the price of the knife was low, its value for me is high. I dread the day I lose or break this knife (or it is stolen by an enterprising yet dishonest blog reader). I don't know how I would be able to replace it. I am sure there are other knives like it out there, but I don't know what they are called or how to find them, and I expect they would cost a lot of money. That's the weird thing about miserly living. I frequently pay a small amount for an item that turns out to be incredibly valuable in my life. Supply and demand is supposed to mean that I pay the "right" amount for the goods I own, which is determined by their supply and the supply of customers willing and able to purchase the item. That mechanism is broken here, and I don't know whether it is my fault, the fault of thrift stores, or a problem with capitalist economics in general. Currently, my best valuation for how many dollars such items are worth to me is not given by the purchase cost, but by the replacement cost. If I purchase a plastic container at the dollar store, then I am not so worried about losing or breaking it, because (at least for the near future) plastic containers will continue to be available at the dollar store for about the same price. But if a blog reader steals my knife, then it will be very expensive for me to replace, if indeed I can replace it at all. The price I paid at the thrift store is the kind of price one would pay for a regular knife, which means that the thrift store probably underpriced the item. Of course, then I would not have bought it, so thank goodness for thrift stores and pricing inefficiencies. What I really want to know is why these knives -- which are clearly superior to regular knives for chopping duties -- are not widely available. Is there a Knife Cabal that is suppressing their production? Is there a lack of information in the market about how great these knives are? Do patents play a role in inhibiting their manufacture? Or is there a lack of information on my part -- that these knives on the market and easy to obtain, but that I don't know what they are called or how to get them? The moral of this story is: don't steal my knife. 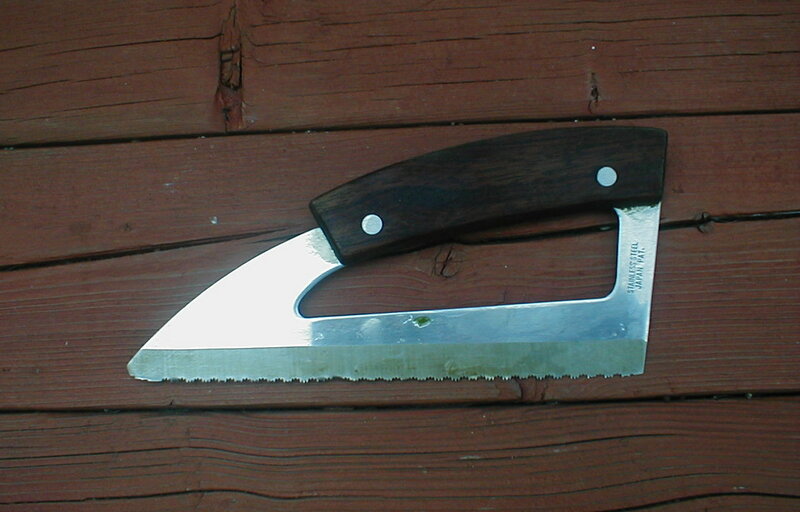 Also, if you see a knife like this in a thrift store, you should purchase it and use it to chop your vegetables.